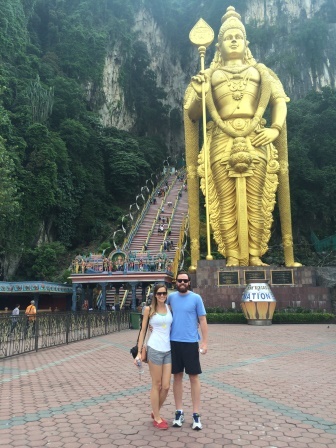 Our first experience in Asia was in Kuala Lumpur during Ramadan and I can’t think of a better or more interesting introduction to Asian culture. 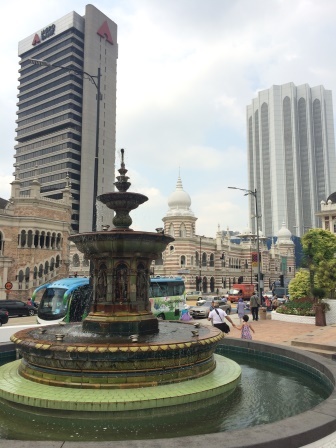 Kuala Lumpur is a fascinating city where Asian, Muslim, and Hindu cultures intersect. This melting pot is reflected in the people, food, music, and culture. 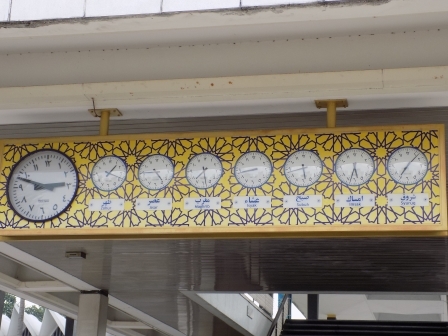 After taking an overnight flight from Brisbane to Kuala Lumpur on Malaysia Airlines and touching down very early in the morning, we took the short 28 minute nonstop train to the city (KL Sentral station) on the KLIA Ekspres. The train runs every 15 minutes during peak hours, every 20 minutes during off-peak hours, and every 30 minutes from midnight to 5am. 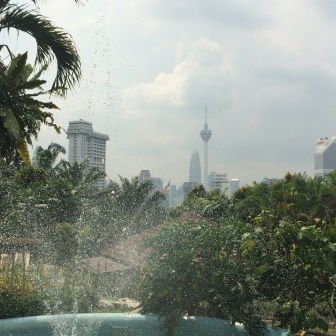 From there, we took a taxi to the DoubleTree by Hilton KL, where we checked in and used the spacious gym locker rooms to shower and change while we waited for our room to be made up. The staff also gave us complimentary vouchers to the largest breakfast buffet that I have ever seen and we had a great time trying dishes inspired by Asian, Indian, American, and Middle Eastern cuisine. 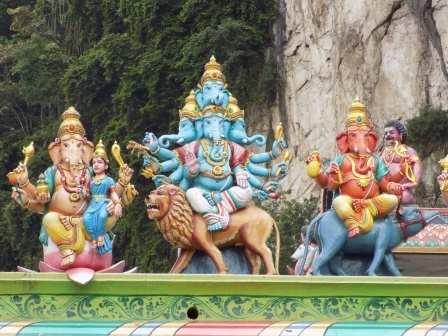 If you only have time to see one place, go to Batu Caves and Ramayana Cave. It’s easiest to take an Uber or taxi there as it’s a bit out of town. 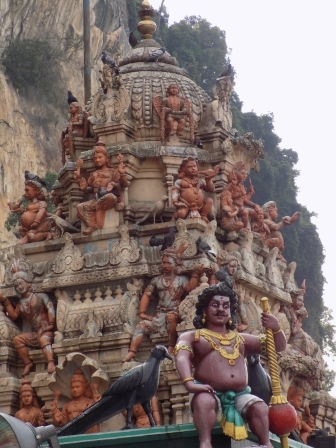 The Caves are made up of Hindu temples and shrines and attract thousands of worshipers during the annual Hindu festival of Thaipusam. 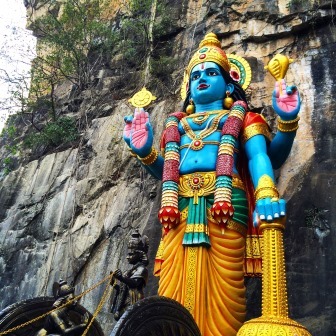 You’ll want to take an iconic photo of the 140 foot statue of the Hindu God Murugan before you climb the 272 steps to enter the caves. 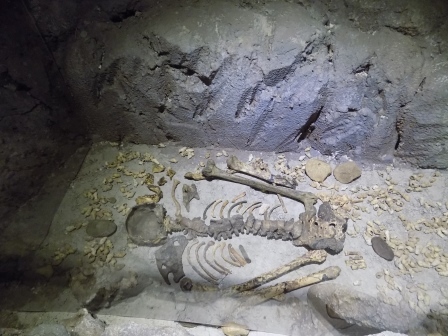 The guided tour of the cave is a fun experience and is worthwhile if you don’t have to wait to long. 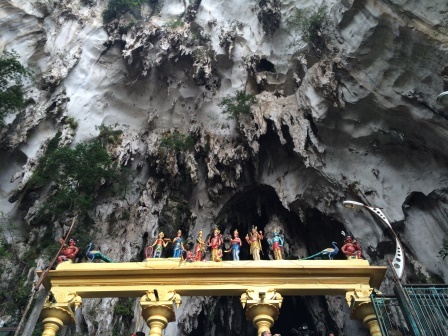 Many people miss the Ramayana Cave (next to Batu Caves); don’t be one of them! 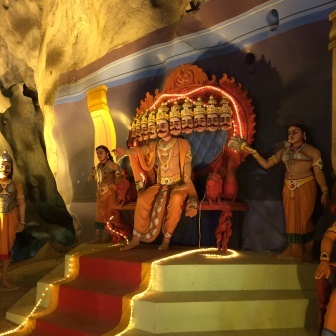 There are incredible paintings and elaborate sculpted scenes of the story of Ramayana. 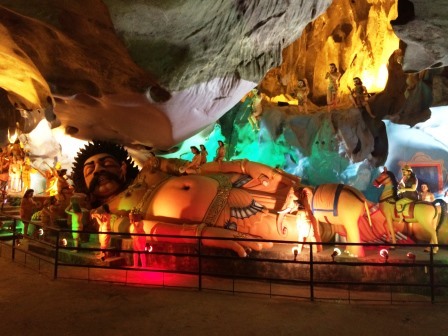 Giant statue of Kumbhakarna, brother of Ravana and a deep sleeper, as you may have guessed! Another tourist hotspot worth visiting is the Petronas Towers, 88 story twin towers that form the centerpiece of KL’s skyline and offer amazing views of the whole city from the Skybridge between the towers. In the towers, you can experience interactive displays that detail the building of the towers and the history of KL’s development. 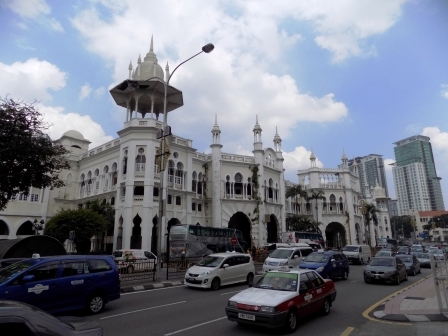 Merdeka Square is the historic and cultural center of KL and is the home to a former cricket field, the National History museum, and the flagpole where the Malaysian flag was first raised after the country gained independence. You can also hop on a free “trolley” at the square to travel between some of the sites. 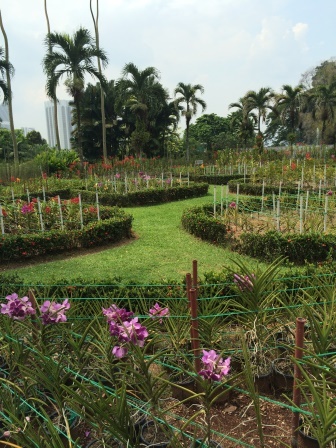 KL Park has several attractions including a walk-in free-flight Bird Park, Butterfly Park, Perdana Botanical Garden, and Orchid Garden. Because you needed cash to enter the Bird and Butterfly Parks and we didn’t have enough on us, we were content to explore the Botanical and Orchid Gardens. 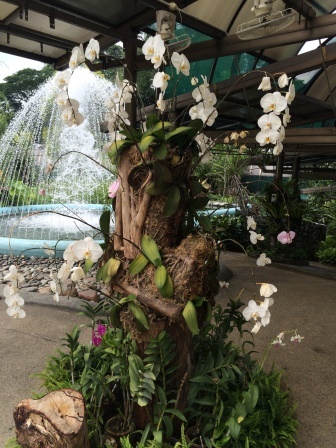 The Orchid Garden houses nearly 800 species of stunning orchids and offers a different, but equally beautiful view of the iconic KL skyline. 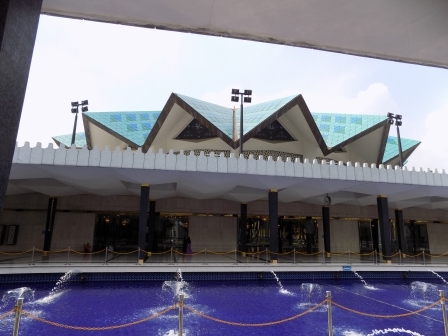 From the Gardens, it is an easy walk to the National Mosque (Masjid Negara). The mosque is open from 6:30am to 1pm, 2:30pm to 4pm, and 5:30pm to 7pm. Robes and hijabs are available for complimentary use if you aren’t dressed appropriately. I really appreciated this so I didn’t have to carry extra clothes with me for the entire intensely hot day! 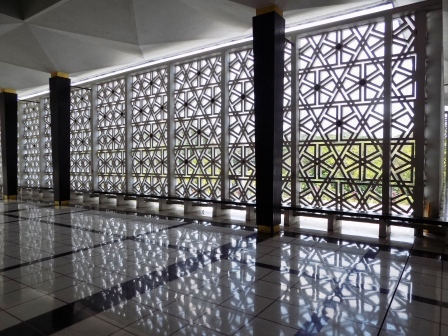 The mosque contains beautiful architectural features including 73 meter minarets, fountains, and a reflecting pool. Even the roof has beautiful detail and was made in the shape of a 16 point star. For shopping and souvenirs, you will want to visit both the Central Market and Chinatown. 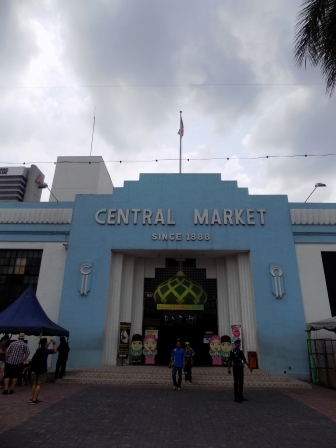 The Central Market, which dates back to 1888, features stalls of all kinds including clothing, jewelry, housewares, and souvenirs. The Annex upstairs also features an Art Gallery on top of auxiliary building. My favorite gallery has an artist who makes batik paintings on silk. You can even make your own under his guidance! 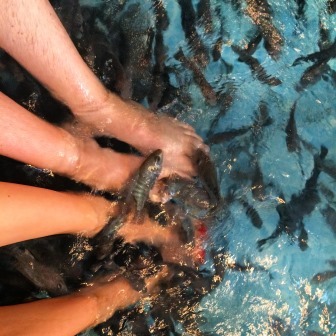 Another highlight of the Central Market was the fish pedicure at the Cute Fish Spa. If you aren’t familiar with a fish pedicure, it involves little fish biting the dead skin off of your feet. 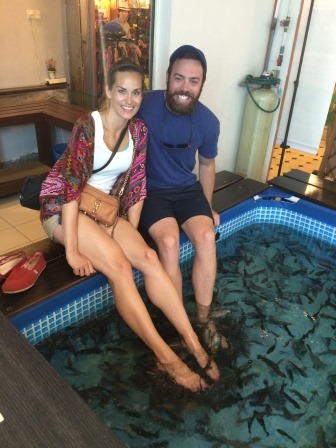 I had always wanted to try a fish pedicure and it did not disappoint! Once you get past the tickling, it’s strangely relaxing! 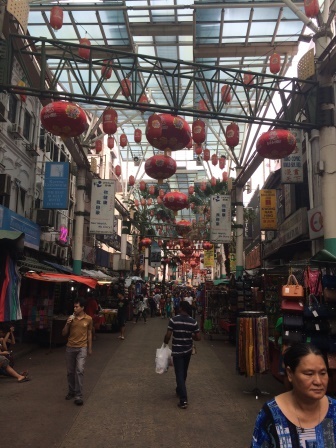 Chinatown, based on Petaling Street, is another great place to pick up a few souvenirs. Personally, I’m not into the “copy bag” scene, but we did get some fun tank tops to bring home with us! 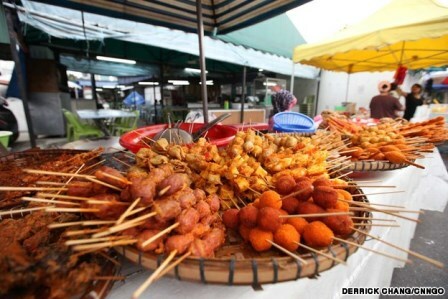 For traditional Malay street food, make a trip to Kampung Baru, the oldest Malay residential area in KL. With authentic wooden houses, the area is especially fantastic during the Ramadan food markets. We ordered a feast of food that we sometimes couldn’t even identify, including satay, meat pies, mango sticky rice, desserts, breads, plantain chips, roti john (a traditional Malay sandwich), and juices (especially the durian). As a testament to the generosity and kindness of the Malay people, someone drove up on a motorcycle and paid for our roti john while we were ordering! We noticed that the Malays looked at us with humor (and sometimes took photos of us) as we tried to pick out different items without knowing what they were. 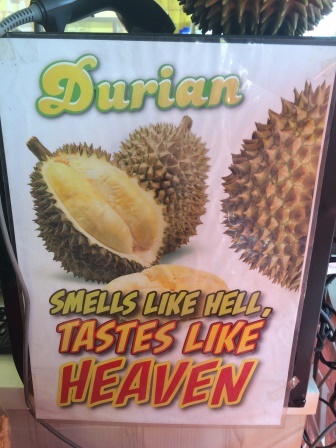 Unfortunately, our love for durian juice did not extend to the actual fruit. 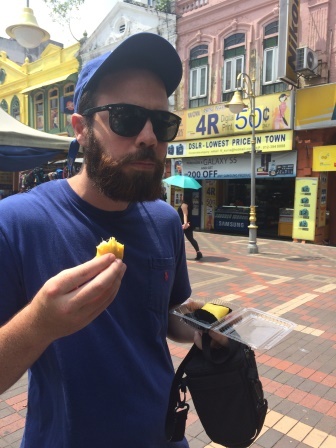 Near Central Market, we tried durian bites and were not impressed. The fruit itself was not unbearable, but it left the worst aftertaste that stuck around for the whole day! 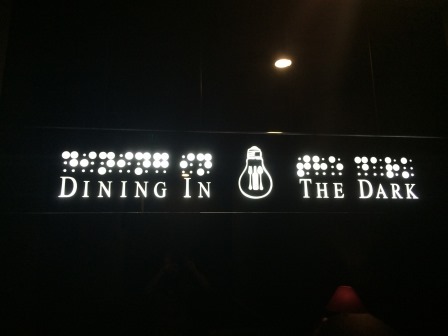 One of the best culinary experiences I have ever had and probably ever will have was at Dining in the Dark (read about the concept here) in the Bukit Bintang neighborhood. For an unforgettable evening, make a reservation now! For well under $100 (around $60 if I remember correctly), we had a four course meal with two glasses of wine. When you arrive, you’ll be blindfolded and offered a few “sense tests” to get you acclimated to the dark (taste test and touch test). After you pass the tests, the staff will take anything on you that emits light (watches, phones, etc) and put it in a locker. Next, your waiter will guide you into a room devoid of even the tiniest bit of light. The waiters at Dining in the Dark are trustworthy guides; they are all visually impaired or blind and communicate by a series of snaps, clicks, and claps. I don’t know that I can adequately describe the feeling of dining in the dark, so you’ll have to go and see for yourself. However, I will say that I was shocked at which items I did and didn’t recognize by taste. For the life of me, I could not figure out that I was eating a scallop or onion soup and I discovered that I actually like lamb when I don’t know that I am eating it! It is also fascinating how quickly time passes when you cannot see anything. At the end of our meal, our waiter asked how long we thought we had been there. We guessed around 45 minutes, but it had already been 2 hours! The menu changes seasonally; see what we ate here. 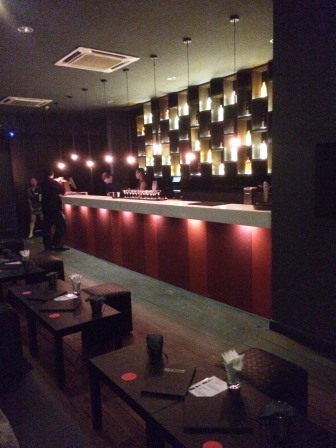 After dinner at Dining in the Dark, stop at Opium for a delicious and inventive cocktail or beer served in a bowl. 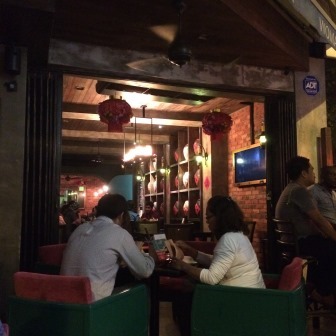 You’ll feel as if you were transported back to an older time in China with the live music and beautiful decor. The DoubleTree by Hilton Kuala Lumpur is centrally located in the city center within a 10 minute walk of the Petronas Towers. The hotel offers a shuttle bus to tourist sites (although we opted to walk or take Uber most of the time) and also connects to the light rail transit station by covered walkway. The staff at the DoubleTree were very friendly and provided us with great recommendations during our stay. The hotel offers several restaurants with varying cuisine and has an outdoor saltwater pool and 24-hour fitness center. 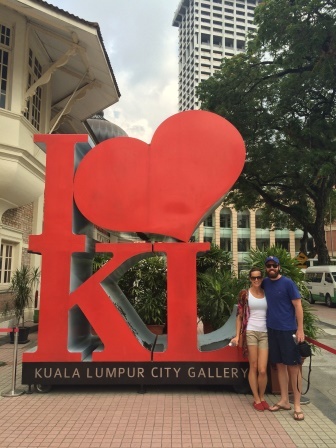 It was a wonderful place to call home while in KL! Ramadan, an Islam holy month of fasting and prayer, typically falls during the summer months, sometime between May, June, and July. 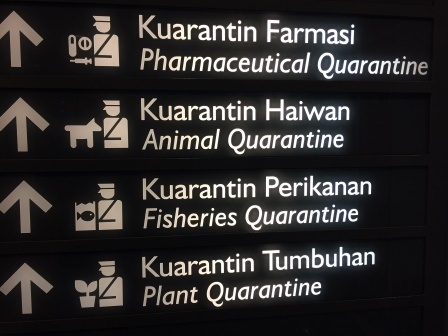 If you happen to be traveling to KL during Ramadan (or any other Muslim country for that matter), count yourself lucky, but remember a few important considerations. 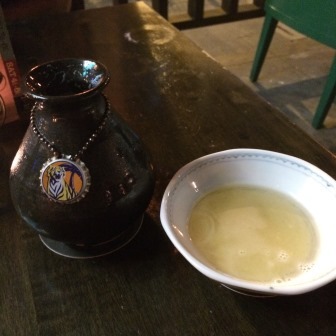 First, Muslims do not eat or drink from sunrise to sunset during Ramadan. Even if you aren’t Muslim, you should respect their fast. It is fine to eat inside your hotel or even inside a restaurant, but do not eat while walking around or sitting in public. 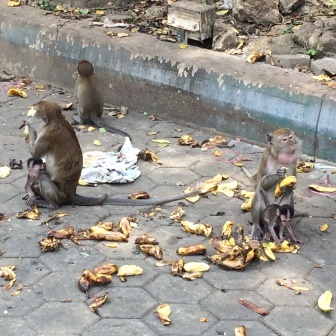 While at the Kampung Baru markets, we made the mistake of biting into a snack and were chastised by people on the street. I felt terrible! 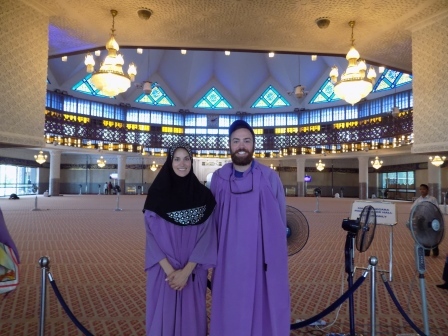 Second, based on my experience and observations, I found that the Malaysians in KL were a bit more laid-back about dress than in other Muslim countries I have been to. I never felt uncomfortable wearing shorts or a tank top, and thank goodness, because the heat in Malaysia was stifling. Third, hours of operation may be adjusted due to Ramadan so just be sure to check online if you can or ask someone if you aren’t sure whether hours will be affected. Finally, rides on Uber were free from 4-9pm during Ramadan, so we frequently took advantage of that when coming home for the day and when going to dinner. Check Uber at your hotel/hostel before you hop in a taxi! As a side note, I loved riding in Ubers and taxis, and not just for the free air conditioning. 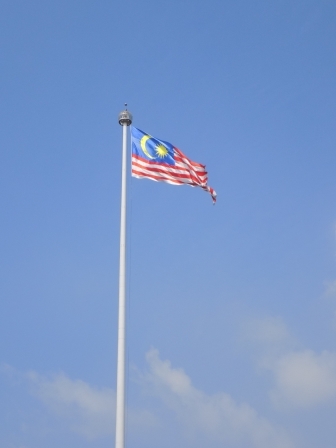 The Malaysian people are so friendly and kind and we really enjoyed talking with them. They always thanked us for visiting their country and were so helpful with recommendations and other information. 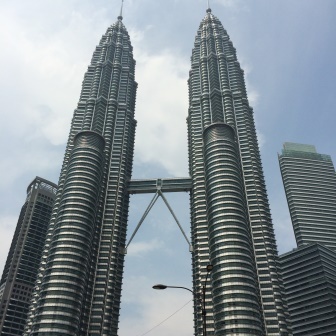 We had a wonderful experience in Kuala Lumpur and I would love to explore more of that region of the world in the future! 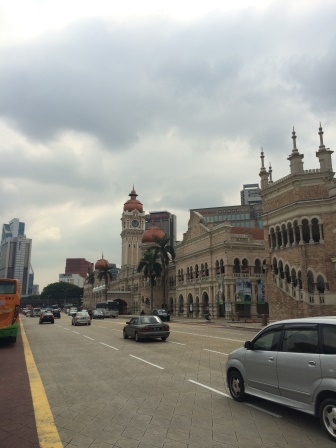 Have you ever been to KL? What did you think? Thanks for reading! Next week, we will be back with stories from Hong Kong! Next 3 days/4 nights in Hong Kong – Victoria Peak, Mong Kok, Discovery Bay, and more!